The West Wimmera Warriors earned their first victory since entering the Horsham Cricket Association at the start of this season when the A grade team defeated Laharum at Nhill on Saturday, but the B grade are still in search of that elusive first win after falling short in their quest ot overcome the Bullants. 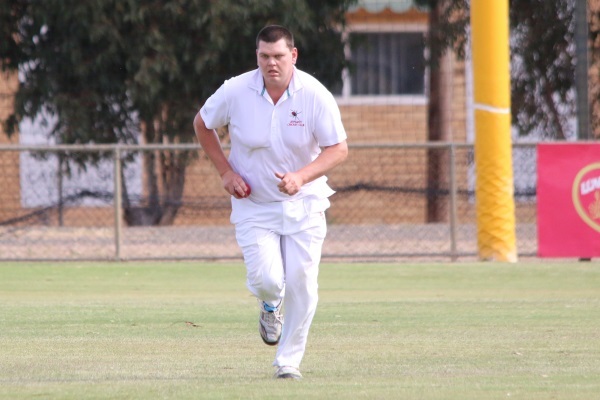 Brad Keller (above) led the charge with his second five wicket haul in as many matches this season, following on from his 7 for 50 against Quantong two weeks ago, when he took 5 for 8 off 7 overs to help dismiss Laharum for just 61 runs which was 86 short of their target. Liam Preston chipped in with two wickets from five balls to end the innings, and Mitch Dahlenburg took one. Josh Lees and Daniel Batson had both taken one wicket each by the end of play on the first day. Only two Laharum batsmen were able to make scored above ten. With the confidence from their maiden win, the Warriors will welcome the competition’s leading team, Homers, back to Davis Park next Saturday as the competition moves back into one day game mode. On the Noradjuha Recreation the West Wimmera Warriors B grade team started the day with the formidable task of matching the Bullant’s total of 266. Bailey Zimmermann fell just two runs short of a half century to be the highest scoring Warrior in the innings, and Steve Leach (24), Trevor James (18) and Dan Cross (16 not out) all continued their recent strong batting form. Although the team batted out 55 overs, they could only make a total of 146 runs, leaving them 120 short of their first victory. Quantong will be their next opponent, in a one day encounter on the Quantong ground next Saturday, but with this opponent sitting in fourth place on the ladder with four wins from their six games, this will present a challenger for the Warriors to earn their first points for the season.